A two-pronged approach for better bowel and GI health. Opti-GI is a unique blend of fibers, herbs and minerals to promote peristaltic action and promote the encapsulation of toxins and metals in a fiber casing to insure safe removal. This cleansing formula has just been improved by the addition of licorice root to help repair and protect the lining of the digestive tract. This revolutionary formula cleanses the intestines and removes unwanted toxins and metals from the body through a different transport system then most fiber detoxification products. Most formulas use a fiber base to "push" toxins and metals out of the system. Although this can be somewhat effective, you risk the danger of having the toxins and metals redeposit into other tissues before they are eliminated from the body. • Encapsulate toxins by utilizing a special blend of non-digestible and functional fibers that are used to surround the metal toxins. A blend of cellulose and proprietary hemiseb plant enzymes are used to partially digest the fibers to form a fiber gel matrix. This matrix them enshroud the toxins and transport them safely out of the body without side-effects. •Chelate and Neutralize toxins: Two unique binding nutrients have been added to this formula to chelate and neutralize toxins; Chlorella and Magnesium Glycyl Glutamine. Chlorella's cellular wall has the ability to chelate (bind) with heavy metals, pesticides, and toxins and carry these substances out of the body. Enzymes within this formula pre-digest this nutrient to its most active form creating maximal results not found with other products. Another powerful ingredient in Opti-Cleanse and Repair is Glutamine. With the unique structure of being the only amino acid to carry nitrogen, this stabilized form is the ultimate nutrient for detoxification yielding beneficial effects on the intestinal mucosa and creating metabolic fuel for the small intestine. REPAIR OF THE GASTROINTESTINAL LINING The exposure of the gastrointestinal lining from stress, poor dietary habits, or from the growth of harmful bacteria can cause pain, discomfort, and even ulcerations. Many remedies on the market cause a number of unpleasant side effects, including liver damage, dizziness, allergies, depression, headaches, hair loss and osteoporosis. 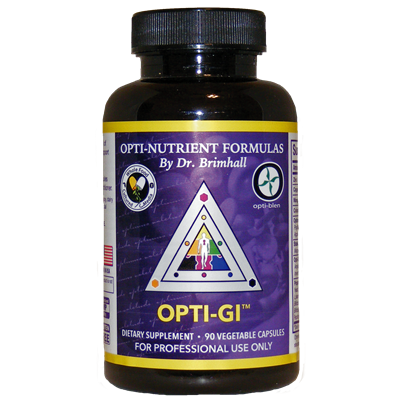 Opti-GI provides a welcomed support for healing by using Licorice root to protect against ulcer formation, aid in the healing of ulcers and prevent recurrent ulcerations. RECOMMENDED: As a dietary supplement, start with 1 capsule in the morning and 1 in the evening, or as directed by a health professional. 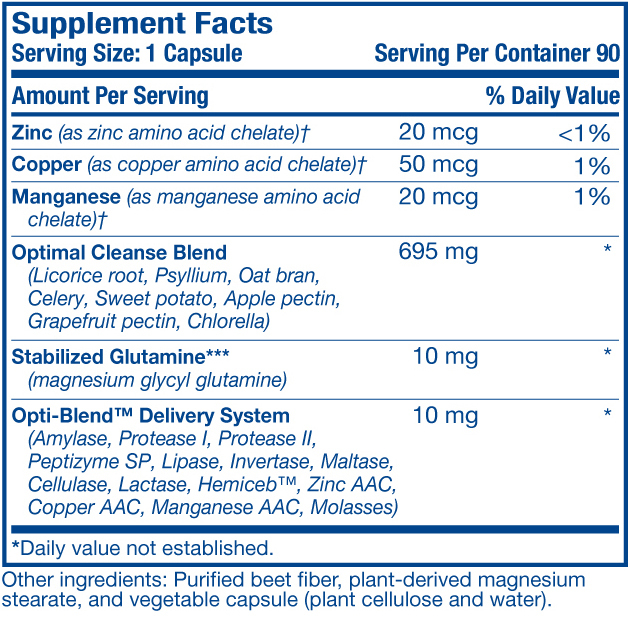 If needed increase 1 capsule every other day until you achieve 2-3 bowel movements per day.